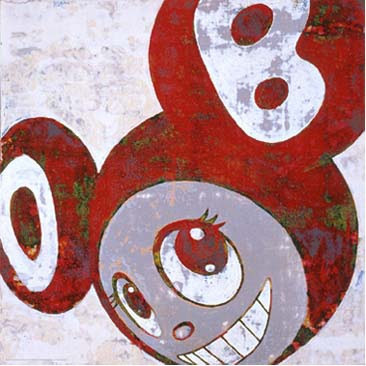 Takashi Murakami's show at MOCA is more than a show. It's a candy colored trip into the changing mind of a manga/anime inspired artist who is evolving his brand and art from a sexual anime form to that to me, that is more interesting--a fusion of pop art, the branding culture, eastern philosophy and imagery with that of japanese cuteness and palette. Sometimes its over the top cute, sometimes its headspinning "out there" which the context of the entire body of work grounds and to some degree begins to explain and provide the sources for the changes in the art. I mean, there are these painting that look like sticks of gum with random eyeballs and teeth that are arranged very much in the austere and precise world of Josef Muller Brockman, the swiss poster designer and proponent of the Swiss graphic design education of the seventies and eighties. Brockman would be on a rotisserie over this stuff. 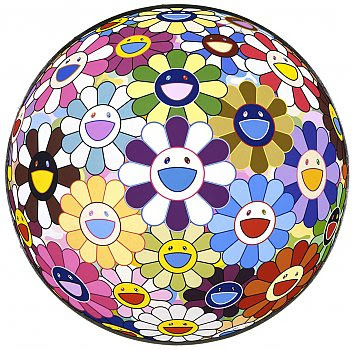 Murakami created the DOB character to express himself and act as a personal brand. 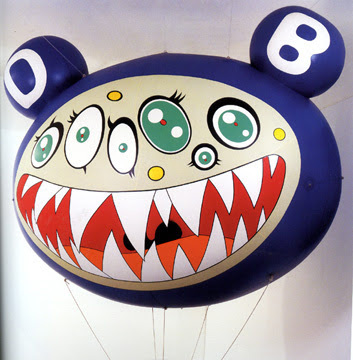 DOB was his first image and brand--a brand that is used exclusively, and manipulated by size color and placement. DOB was best expressed in Murakama's blow up (huge) DOB heads and these almost Mickey Mouse type paintings that had a roughness-- a painted tie dyed quality that took it off his normal "Superflat" painting technique that defies the hand and could be screen printed or even better, cut vinyl. DOB evolved to Kaikai + Kiki (adorable little Mutt and Jeff characters who are rendered either front on or just their heads--in shades of hot pink and white). 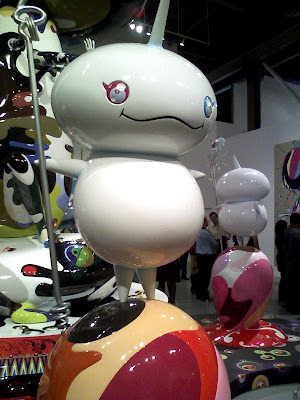 I first saw Kaikai and Kiki at Art Basel Miami at a Gallery--they were full sized fiberglass, painted figures--that were striking and funny. However, it was not knowing the context of the pieces that just made them a cute oddity like the trike D'zine did. They are, however, part of a much bigger idea. DOB was best expressed in Murakama's blow up (huge) DOB heads and these almost Mickey Mouse type paintings that had a roughness-- a painted tie dyed quality that took it off his normal "Superflat" painting technique that defies the hand and could be screen printed or even better, cut vinyl. His evolution to room sized, enormous, complex forms expressing both the anime, lessons from DOB and a new component, eastern religion and religious iconography. His Oval Buddha, 2007 has a duality of personality of his main character sitting atop a turtle complete with lotus details and leaves as part of the design. There are tiny figures plunging into and out of the head with a janus like quality--one face at rest, the other with it's mouth wide open with thousands of big conical teeth, layer upon layer of them much like a shark. As I toured around this figure (well over 5 meters tall according to Murakami in his Moca video)--more and more of the detail sunk in...This is an object and yes, an entire show well worth seeing for the first time to just settle into the aesthetic. Beyond that, I would visit at least two more times just to dig into the detail. If I were a starting artist, this show would change my palette and perspective on my art. It is noteworthy. Beyond that, Murakami is also clever. His work is sold through his own venue--books, teeshirts, buttons, and plastic characters. Inexpensive stuff he marks up to the max. His work originally sold a trinkets sold with gum. Clever man--learning the non magic of how that happens. 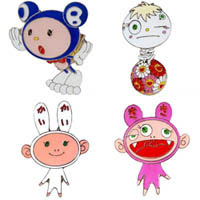 Beyond that, he has taken it way beyond the world of Kid Robot and into the collections of sincere art collectors. 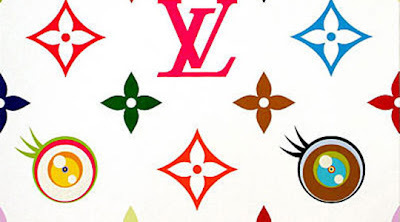 He took the Louis Vuitton pattern and monkeyed with the color and started tweaking it with his eye shapes, with happy cherries and a variety of his little visual icons. Marc Jacobs saw the work and now Louis Vuilton and Murakami are collaborating on some very expensive but very cute (say Asian cute!) bags and accessories. My favorite is a steamer trunk built with shelves and on those shelves are dozens of the same bag with the accent color changing...so essentially , it is a different (but the same) bag for every day of the month. Can you say KaChing? I am inspired by this man, his work and will be curious to see how it evolves in the next decade as the money has been made, there are new works in film (the KaiKai + Kiki was at MOCA along with the new video done with Kayne West) and his visuals are expanding to take it to a more cerebral while pop inspired place.